If Peter Roskam is the groundhog, then we should expect six more weeks of winter. That's because team-Roskam emerged from their district office this week, saw a member of the press, and ran back inside. "They brought a reporter with them and so that was not part of the understanding," Roskam said Thursday. 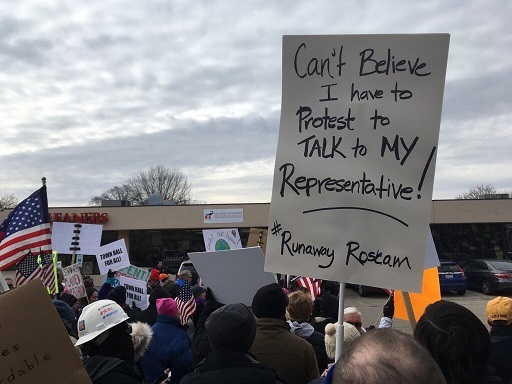 The constituents were denied entry into Roskam's district office at the DuPage County Airport in West Chicago. When asked why the vestigial Lake County Congressman maintained a district office in a hard-to-access location like a County Airport, a spokesman for Peter Roskam said: "You never know when you need to make a fast get-away." Well a pretty stupid move on the constituents part. They had a great opportunity to meet with their congressman but are more interested in some other idealogical/partisan message than hearing from their elected representative. Good on Roskam. Reschedule and tell them to grow up.